Meet the Artmakers: And the Beat Goes On! Cranes and bulldozers have been digging up the Ford stage, but that doesn’t mean we’re going to stop jamming! Starting March 5, we’ll be presenting JAM Sessions all over LA County – from Watts to Newhall and many places in between. Be sure to sign up here to get the latest scoop (of JAM)! Last month, we introduced you to Ford staff members who make it all happen. This month, we sat down with frequent JAM facilitator and Freedom Drum Circles founder Christopher Ramirez. What excites you most about JAM Sessions? Christopher Ramirez: To see parents and children playing music together is very inspirational. And, seeing people that don’t know one another creating rhythms as one brings a smile to my face. I also love how JAMs create a very safe space for everyone: people of all ages, skill levels and backgrounds. Can you share a memorable moment from your JAM experiences? CR: At the end of one drum session, there was a woman who just kept on drumming – even after the rest of the group had stopped. She had her eyes closed and was creating her own rhythm. When she stopped, she explained that she was pregnant and that she hadn’t felt her child move for weeks until that drum circle. Everyone cheered and hugged her. It was an incredible moment. What have you learned from facilitating JAMs, as an artist and as a community member? CR: I’ve learned that art can create a platform in which we transcend our perceived limitations and differences. Specifically, I’ve learned how drumming can be a tool to help build community spirit. 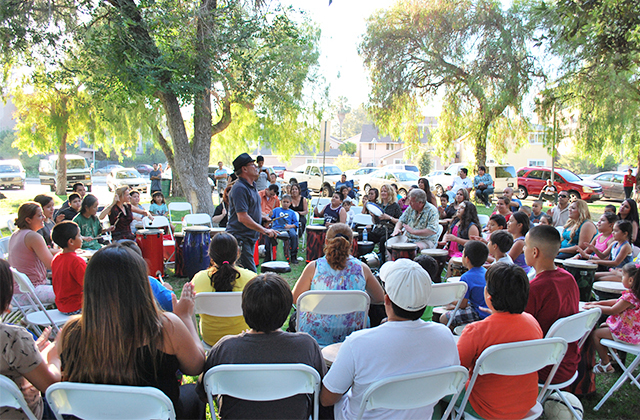 A recent drum circle JAM Session in San Fernando. CR: I can’t imagine a world without music and the arts. After all, the heart is the rhythm we were all born with. So, it is our birthright to play music! I recently read a study that found that 80% of people in the USA wished they played music. Only 10% of those people were professional musicians and the others were passive observers. I want to change that and JAMs are a great way to start. What’s the first art experience you can remember? CR: I remember coming home from school and walking into my house. The front entry was always filled with traditional Mexican music – that was my parents for you. The middle of the house was filled with R&B and soul music – that was my sisters for you. The back of the house was filled with rock ‘n’ roll and jazz – that was my brothers for you. The house was always filled with music! CR: My first Ford JAM Session this year will be in San Fernando on April 4! Christopher Ramirez is a percussionist, drum circle facilitator, songwriter, arranger/producer and drum instructor.